Sometimes we need to upload images, a video or clippings and it has to be done quickly. 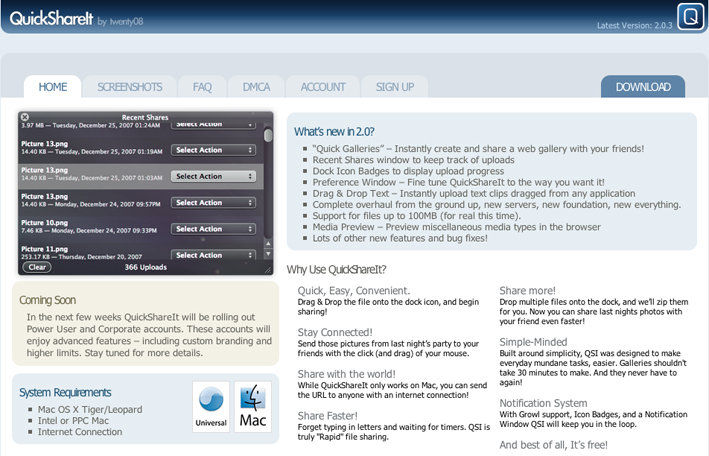 QuickShareIt is a helpful free Mac application that will allow you to do so. Without setting up an account you can download the application, add it to your applications folder and drag the QuickShareIt to your dock. Then you can drag and drop your files to start uploading to the QuickShareIt servers. If you set up an account you can also easily organize your files. It is possible to upload files up to 100MB, which is a lot. If the upload is completed a window called Recent Shares will pop up and you are able to see the file name, size, time and date of the uploaded file. By clicking the button right of the files you can copy the file’s URL to your clipboard and email the link to your clients or friends. If you want to try QuickShareIt, just download the application and run it.